"How should I wash curly clip in human hair extensions to stop them tangling?" We like to be inclusive so instead of just addressing curly clip in human hair extensions below is a guide to washing curly, wavy and straight clip in hair extensions. The first method is for deep wavy, curly and long (20 inches or more), straight and wavy textures. The second method is for shorter (18 inches or less), straight and wavy textures. Caring for clip in hair extensions can be divided into three areas; daily styling products and tools for clip in hair, washing clip in hair extensions and of course caring (nourishing) which includes oils and conditioners. As this is about human hair extensions try to use shampoos and conditioners for chemically treated hair. The better options for those without Sodium Lauryl Sulphate and its cousin, Sodium Laureth Sulphate - these ingredients are quite harsh for human hair and you can check out an article about SLS and SLES at http://cincovidas.com/is-sodium-lauryl-sulfate-from-coconut-safer-than-regular-sls/. 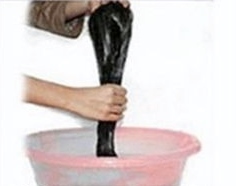 As part of being inclusive, we’ll mention that for those who prefer a "no 'poo" approach to washing hair, use your homemade or shop bought alternatives. The best way to prevent tangling is to wash the clip hair extensions in an upright position. Mix your shampoo with some warm water in a spray bottle or empty water bottle (filled with no more than 500ml of liquid) and set aside. If you have neither of these, then use the shampoo straight out of the bottle. Detangle when the hair is dry. Always start at the ends and work up to the clips. Use your fingers first and then a wide tooth comb; gently tease out any tangles without pulling or tugging at the hair. If you pull at the hair and over-stretch it, the deep wave or curly texture will become distorted. Spray the clip in hair extensions with your shampoo mixture until the hair is saturated but not dripping heavily. Use the wide tooth comb to distribute the shampoo mix (starting at the ends of the hair and working upwards). Don't rub or massage the hair as this causes it to tangle. Rinse the hair by running lukewarm water over the clip in hair. Yes, that's right, rinse; the shampoo and water mixture has done its job of trapping the oil, styling product build-up and dust and is ready to be rinsed away. Gently squeeze starting at the top near the clips and work your way down to the ends, but don’t wring the hair. Repeat steps 3 and 4 if you think the hair is not clean. After rinsing, gently detangle (as in step two). This removes any tangles and ensures that each of the small sections of hair that make up the individual locks of deep waves or curls can reform. Apply serums and hair oils to damp hair to seal in moisture; use your wide tooth comb to distribute (there’s a guide to the best oils for curly lace wigs). Alternatively lightly mist the clip in hair extensions with spray moisturizer (there’s a guide to the best types of moisturizer for curly lace wigs). Curl and wave patterns become distorted when the hair is dried flat. Always hang deep wave and curly clip in human hair extensions to air dry in an upright position; this is essential for retaining the uniform wave and curl pattern. Washing clip in hair extensions is like washing a wig. This method is so easy, that words aren’t necessary. The pictorial guide below is easy to follow but there’s also a more detailed version of this process for wigs that you can peruse). If you’d like more clip in human hair extension care tips, peruse the guides about clip in hair oils, daily styling and conditioning clip in hair.